Our Deck-Pool model is a truly unique design. Its the only set of high-quality, freestanding, rectangular, permanent on-ground pools that are actually designed to accommodate our customers own custom deck addition. 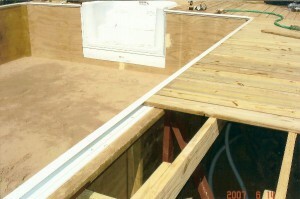 You can even integrate your existing deck seamlessly. 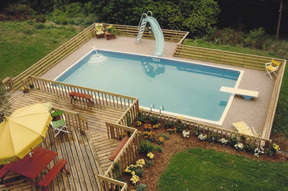 The Aqua Star Deck-Pool and Olympic-Eagle on ground pools are available in many sizes: 12×20, 12×24, 16×24, and 16×32 rectangles; 20×20, octagon, and 20×28 emerald shapes. Custom sizes are also available. Our above ground pools and Olympic-Eagle rectangular shape maximizes pool usage for volleyball and all-out swimming. Let the kids line-up and race for all they’re worth! Kicking off our strong pool wall is never a problem. Almost all commercial, high school, municipal, YMCA, and other public pools are shaped rectangular. The Aqua Star above ground pool is functional and practical. Our Deck-Pool and Olympic-Eagle swimming pools are the only on ground pools that feature an optional extended walk-in staircase! No other pool can say that. Imagine the benefits of an in-ground swimming pool style steps. The ladies love it for their graceful entrances and exits. The kids will sit and play. Dad will lay back with his drink at hand and feet afloat. Older folks can get in and out easily. A corner drop-in step is also available. 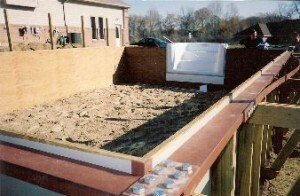 All of our Deck-Pool and Olympic-Eagle pools are built with Construction-Grade materials the strongest in the industry. We use the same high-quality materials a builder would use to build your house or deck. Don’t opt for flimsy plastic, resin, sheet metal or other lightweight swimming pool materials that other manufacturers use. 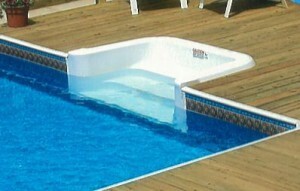 Our average above ground swimming pools package weighs over 3000 pounds! But, don’t worry, we deliver right to your yard. Aqua Stars incredibly strong on ground pools can be built in any backyard, regardless of terrain. Sloping ground, hilly sites, high water tables and rocky soils that can run up the installation costs of other pools are not a problem with an Aqua Star on-ground polls or Olympic-Eagle swimming pools.